Hamilton County, OH…….. Public health is credited with adding 25 years to life expectancy in the United States over the last century. For example, when you drink clean water or eat safely in food service establishments, public health is involved. When children avoid contracting communicable disease because they have been vaccinated, public health has a role. Recognizing tobacco as a health hazard. 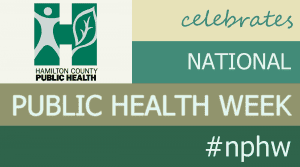 Visit Hamilton County Public Health at www.hcph.org or the Centers for Disease Control and Prevention at www.cdc.gov to learn more about public health and its ongoing role in protecting and advancing our health.